Please call owner David at 850-694-1782 or 850-926-8307. E-mail ofthepeace@comcast.net Boat Location: Crawfordville, Florida. 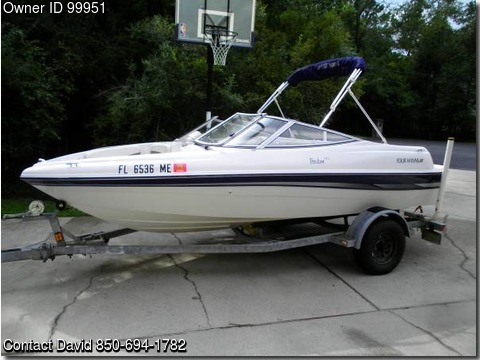 2003 Four Winns Freedom 170 – 135 hp Mercruiser, I purchased this boat new and ran it on weekends during the summer each season. Regularly maintained,ran mostly in freshwater but not exclusively flushed religiously after each use, no chips or scrapes in gelcoat, upholstery in excellent condition. Newly rebuilt carburetor – engine runs like new. equipment, galvanized trailer with retractable tongue, leaf springs replaced 3 years ago, new rollers 2 seasons ago and new tires last year.